MAIN POINT: Much controversy has been occurring in Christian circles. On the one hand, theologically, we agree that God is the main audience in any worship. Yet, in terms of practice, we often behave as if the congregation is the main target. For two weeks, SabbathWalk will attempt to shed some light on this, that worship is God-Centered as well as People-Scented. Part One deals with God-Centered aspect. Part Two will be published next week. Thinking that by simply going through the motions of sacrifices, Saul has forgotten and taken for granted that worship is about God, not about following certain rituals. The history of Israel is also checkered with instances where Israel offered the acts of sacrifice without the attitude of obedience. Throughout the discussion last week, I emphasize the need to educate people that worship is not merely the choosing of songs, the sub-contracting to experts, or experience seeking. 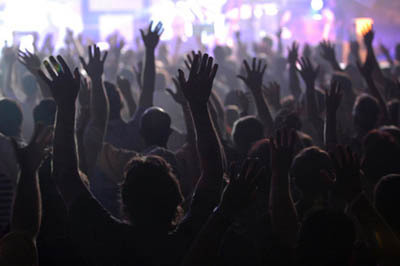 Worship is in essence a delicate exercising of two aspects: God-Centered and People-Scented. Being God-centered means we adopt a stance of letting God speak even though we do not feel like singing, or when we do not feel like worshiping. Worship must be God-centered. It is important to recognize that in worship, we do not make human comfort our first priority. Before a Holy God, worship can shake us out of our comfort zone. The goal of worship is not to make ourselves comfortable, but to seek to put God first and central, REGARDLESS of human comfort. After all, if one desires comfort and entertainment, one can go lie on a couch, or to sleep in on an early Sunday morning. Why do we have to sacrifice our beauty sleep in the wee hours of the morning, drive many miles to Church, and to sit together with a group of people who are largely unmotivated to sing? For this, I have observed many people who simply remained silent throughout the singing session called 'worship.' They look bored. They look with disinterest. This is a shame. While the music team and the worship leader try their best to lift people up, so that they can lift the LORD up, some members of the congregation prefer to sit and do their own thingie. Things like fiddling with their iPhones or mini-tablets. Things like flipping the Church bulletin from cover to cover. Things like thumbing their MP3 players. Things like mentally criticizing how the entire Sunday service has been conducted. "Worship changes the worshiper into the image of the One worshiped." I like this definition. It goes very well with another of my favourite classic quote on worship. The moment we feel worship is about our own comfort, our feelings occupy prime space. When we recognize God is central, our desires become secondary. For Abel, the LORD is the central of his worship and his attention. This is why he is able to offer up the first-fruits without hesitation. Abel gives the best, over and beyond the minimal expectation. Cain on the other hand, is too self-conscious before anything. He calculates what belongs to whom. He begins with a me-first paradigm. He puts God in his plans, instead of letting God be the planner, to be the overseer of all his plans. Cain gives the minimal required. Key Point: If worship is about ourselves, and about our own fancies and likings, we will be turning worship and making it into our own image. God forbid! Worship is not about us. It is all about God. One of the most discouraging things during a Sunday worship service is when people do not sing. They become standing spectators, waiting for the whole singing session to end. Some members even make it their point to come to Church late, just in time to listen to the sermon. I feel such an action is too self-centered. These people have forgotten that worship is more than a sermon. Worship is the giving of ourselves to God through singing and listening, through giving (of tithes) and receiving (of the Word), through serving one another, and through encouraging each other. These acts of worship remind ourselves that God is our purpose of worship. We fail to exercise God-centeredness when we do not sing. One reason is because we are not grateful enough. I believe being thankful aids worship. It helps us to appreciate what God has done for us. It tells us the reason we worship is completely based on God's work, not ours. It reminds us again that we cannot focus on what we do not have, when we already have so much. The late American author, William Arthur Ward says this well about gratitude. How true! If we are together with the Church people, and do not sing at all, we deprive the persons around us the needed encouragement to praise and worship. We need to exercise this through not taking one another for granted. If we do not sing, we take the worship team for granted. If we do not follow the instructions given by the worship leader, we take the worship leader's hard work for granted. If we do not worship together as a community with earnestness, we take God for granted. I believe as a community, we can help one another by singing and praising God with a deeply thankful heart. We cannot simply say we are grateful with our lips tightly zipped. We can sing. We can shout for joy. We can praise in unity. We can pray in unison. Like singing a national anthem, or to shout in support of our favourite football team, singing together knits our hearts together when we praise TOGETHER. KEY POINT: When we do not sing, we are in danger of taking God for granted. C) What if We Do Not Feel Like It? "What if I do not feeling like worshiping today?" I can understand. Our moods do change. What about prayer? Surely you can do prayer? Surely you can ask the Spirit of God to search your heart? Surely you can remember the words in front of you, then close your eyes to meditate on them, and sing the words along as an act of corporate worship? King Saul offered his worship simply because he felt like it. He felt that his own time is more important. He felt that sticking to his own scheduled appointment is more important. As a result, his impatience and desire to rush off to do his own thing makes his worship totally unacceptable to God. If our worship is not God-centered, we succumb easily to our feelings. Compare that to King David. David worships God in both good times (Ps 95) as well as needy times (Ps 86). KEY POINT: When we do not feel like worshiping, ask God for help, instead of simply shrugging it our with an unhappy stance. Tell yourself that worship is about God, not you. Worship is not about keeping your feelings from God, but about letting your feelings known to God, to let Him take control. Pray unceasingly. Pray for self. Pray for your neighbour. Sleep earlier the night before. Wake up earlier to avoid the mad rush for the bathroom, breakfast, or the busyness of traffic. Pray for your leaders, the worship team, and the servants each Sunday. If the songs are unfamiliar, you can still READ the words aloud. When you do not feel like it, add in softly "God help me to...." praise you, thank you . . . . I believe a praying disposition will always help us worship better. Worshiping is not about singing but about proclaiming God's faithfulness and goodness. Worshiping is not about following through the rituals of a Church service, but obediently staying together as a body, to direct ourselves and others around us toward God. Worshiping is not about making sure our emotions are in sync first. It is about coming to God just as we all, emotionally wrecked or solid, and to offer our lives a living sacrifice to God, wholly and acceptable to God. That authentic offering our ourselves, our ups and downs, and best and our worst, is the living sacrifice that God seeks. Perhaps, the way to understand a worshipful experience is not what happens during the worship session, but the fruit of worship AFTER the worship. Think about it.